The one of most popular assault rifles, and for many special forces operator, a first pick. The M4 carbine is a family of firearms tracing its lineage back to earlier carbine versions of the M16, all based on the original AR-15 designed by Eugene Stoner and made by ArmaLite. 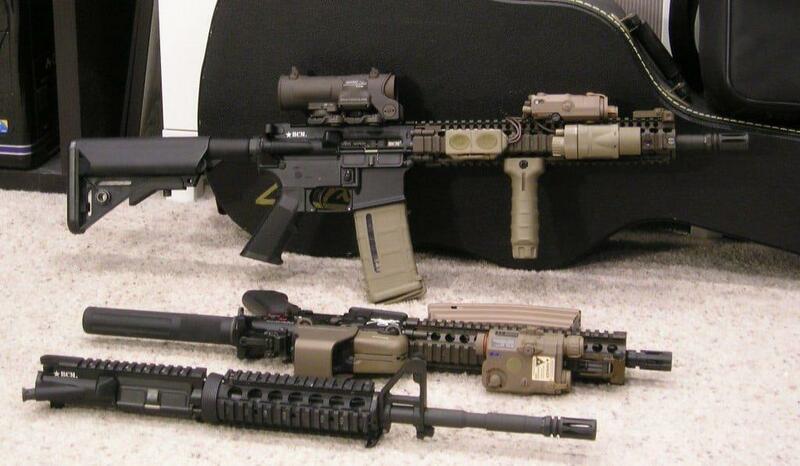 It is a shorter and lighter version of the M16A2 assault rifle, with 80% parts commonality. The M4 has selective fire options including semi-automatic and three-round burst (like the M16A2) while the M4A1 has a “full auto” option along with three-round burst. 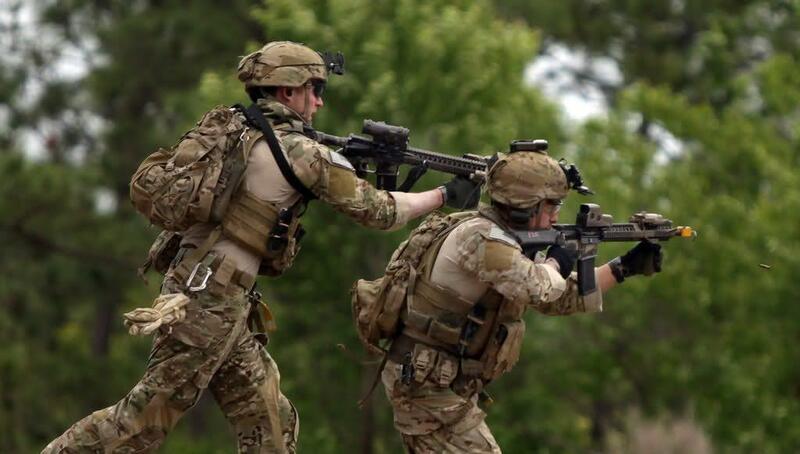 The M4 and variants fire 5.56x45mm NATO ammunition (or .223 Remington ammunition) and are gas-operated, air-cooled, magazine-fed, selective fire firearms with a multi-position telescoping stock. Original M4 models had a flat-ended telescoping stock, but newer models are now equipped with a redesigned telescoping stock that is slightly larger with curvature at the end. The M4 is similar to much earlier compact M16 versions, such as the 1960s-era XM177 family. Some of those visual designs are obvious in both weapons, however, most of the similarities are not very noticeable. As with many carbines, the M4 is handy and more convenient to carry than a full-length rifle. The price is slightly inferior ballistic performance compared to the full-size M16, with its nearly 6″ (15 cm) longer barrel. This becomes most apparent at ranges of 300 yards and beyond. Statistically, however, most small-arms engagements occur within 100 yards. This means that the M4 is very much an adequate weapon for the majority of troops. The marginal sacrifice in terminal ballistics and range, in exchange for greatly improved handling characteristics, is usually thought to be a worthwhile compromise. While the M4′s maneuverability makes it a candidate for non-infantry troops (vehicle crews, clerks, and staff officers), it also makes it ideal for close quarters battle (CQB). The M4 was developed and produced for the United States government by Colt Firearms, which had an exclusive contract to produce the M4 family of weapons through 2009; however, a number of other manufacturers offer M4-like firearms. The M4A1, along with the M16A4, have mostly replaced the M16A2; the U.S. Air Force, for example, plans to transition completely to the M4. 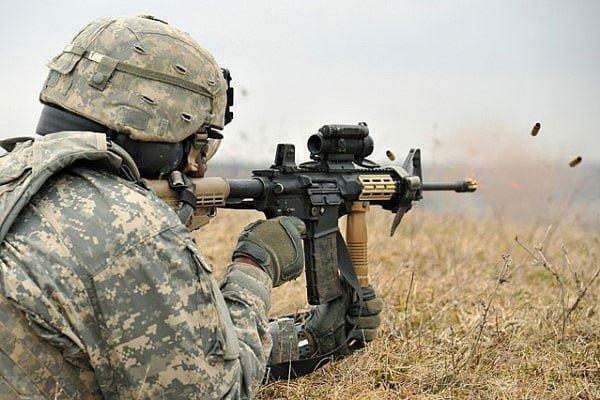 The M4 is also the standard rifle for U.S. Air Force Security Forces members whether at home station or deployed abroad. They maintain a yearly qualification on it. The United States Marine Corps has ordered its officers (up to the rank of lieutenant colonel) and Staff Non-commissioned officers to carry the M4A1 carbine instead of the M9 handgun. This is in keeping with the Marine Corps motto, “Every Marine is a rifleman.” United States Navy corpsmen will also be issued M4A1s instead of the M9. The M4A1 carbine is a fully-automatic variant of the basic M4 carbine intended for special operationsuse. The M4A1 has an “S-1-3-F” (safe/semi-automatic/3-round burst/fully automatic) trigger group while the M4 has an “S-1-3″ (safe/semi-automatic/3-round burst) trigger group. The M4A1 is used by almost all U.S special operation units. 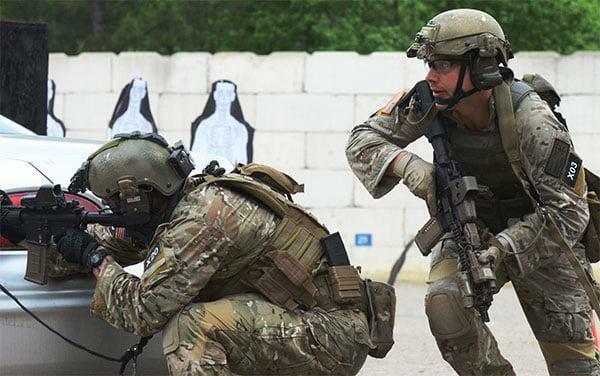 The M4A1 is especially favored by counter-terrorist and special forces units for close quarters combat because of the carbine’s compactness and firepower. These features are also very useful in urban warfare. Although the M4 has less effective range than the longer M16, many military analysts consider engagement with a non-specialized small arm above a range of 300 meters (330 yds) to be unnecessary. It is effective at ranges of 150 meters (160 yds) or less and has a maximum effective range of about 500 to 600 meters (550–660 yd). In the last few years, M4A1 carbines have been refit or received straight from the factory with barrels with a thicker profile under the handguard. 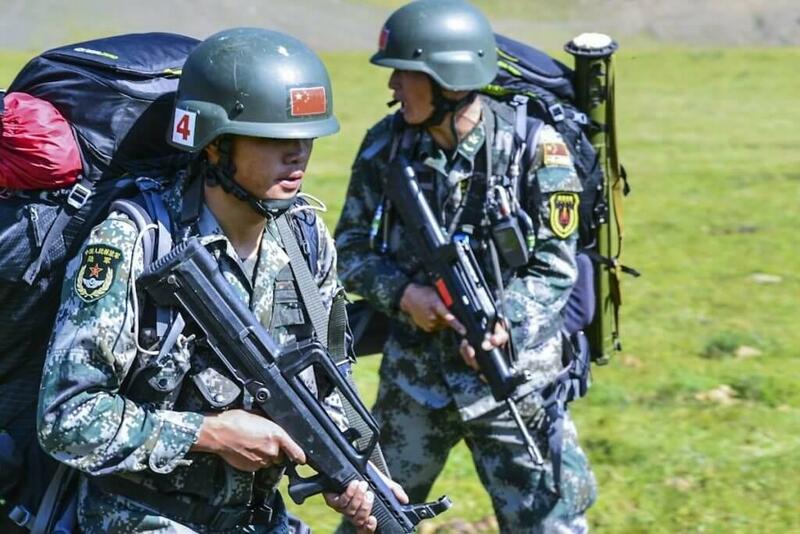 This is for a variety of reasons such as heat dissipation, which is useful due to the complaints of high-heat production from test soldiers, which occurs during full-auto and accuracy as a byproduct of barrel weight. These heavier barrel weapons are also fitted with a heavier buffer known as the H2. Out of three sliding weights inside the buffer, the H2 possesses two tungsten weights and one steel weight, versus the standard H buffer, which uses one tungsten weight and two steel weights. These weapons, known by Colt as the Model 921HB (for Heavy Barrel), have also been designated M4A1, and as far as the government is concerned the M4A1 represents both the 921 and 921HB.